French President Emmanuel Macron gave Donald Trump a tree sapling on a state visit to the US on Tuesday. The European Sessile Oak that Macron bestowed upon his US counterpart has historical significance as it came from Belleau Wood in northern France, a World War I site where thousands of US Marines lost their lives in 1918. "100 years ago, American soldiers fought in France, in Belleau to defend our freedom," Macron wrote on Twitter. "This oak tree (my gift to @realDonaldTrump) will be a reminder at the White House of these ties that bind us." 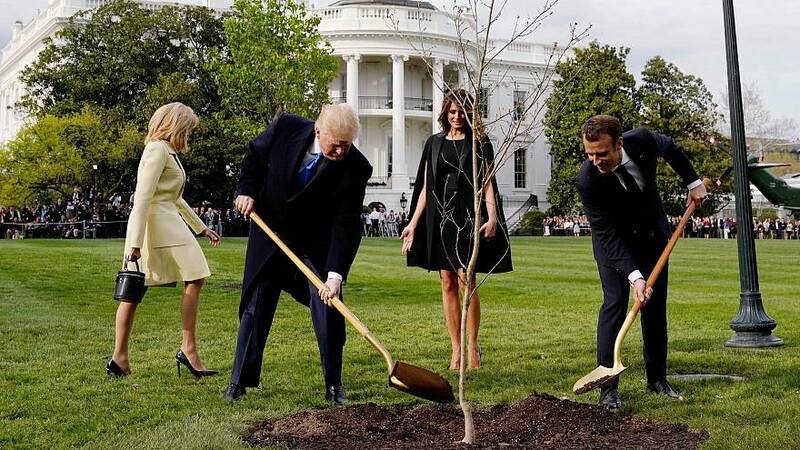 In a great photo opportunity, the two leaders cemented their apparently blossoming friendship by using shovels to throw earth onto the freshly planted tree. Needless to say, where there is a potentially-iconic photograph, there is also the material for a meme. Twitter saw a flurry of spoofs with French and American users alike making both political and in some cases downright silly parodies. One tweet made reference to former FBI director James Comey’s memoir "A Higher Loyalty," which topped 600,000 copies in the US this week. Trump previously referred to the memoir as a "badly reviewed book" that raises "big questions". Another Twitter user pointed out the Renaissance syle brought to the picture by Melania Trump's hand position. Some made reference to TV shows, with one user drawing a comparison between the photograph and the press photographs for American show "Desperate Housewives". Some got handy with Photoshop to illustrate their blags. In a nod to the upcoming Eurovision song contest, comparisons were drawn with another well-known foursome — Swedish pop group ABBA. One French user got in on the trend replacing the tree sapling with Trump and Macron and depicting their politicial adversaries, self-proclaimed "democratic socialist" Bernie Sanders and French far-left politician Jean-Luc Mélenchon, buring the two leaders. Finally, one person on Twitter pointed out that a tree was the perfect way for Macon to "troll" Trump over the Paris agreement on climate change mitigation, after the US president announced in July 2017 that he would cease all participation in the groundbreaking 2015 deal. In an address Wednesday to a joint meeting of Congress, the French president said he was “sure” the US would one day return to the Paris climate change accord. Macron's visit to Washington will span three days and while the two leaders put on a friendly display they not only disagree on the Paris Agreement but also the Iran nuclear deal. He added that he and his host would look at the Iran deal “in a wider regional context,” taking into account the situation in Syria.